What Is DA Form 268? The most recent version of the form - sometimes incorrectly referred to as the DD Form 268 - was released by the Department of the Army (DA) in May 2016. An up-to-date DA Form 268 fillable version is available for download and digital filing below or can be found on the Army Publishing Directorate website. All the previous editions of the form are obsolete. The DA 268 is prepared to reflect that favorable personnel actions are suspended with regard to the affected Soldier. Its mandatory to suspend these actions if military or civilian authorities initiate an investigation into the soldier's conduct that may result in disciplinary or administrative actions. What Is Da Form 268 Supporting Documentation? How To Remove A Flag On Da Form 268? For use of this form, see AR 600-8-2; the proponent agency is DCS, G-1. DA Form 268 supporting documentation includes APFT cards, Body Fat Worksheets, counseling statements and punishing directives. The DA 268 will be submitted by the unit with supporting documents to the General Officer Management Office. The Flag will then be entered into or removed from the Soldier's personnel file. Investigations of general officers are performed by The Inspector General. The General Officer Management office will Flag these general officers during internal and external investigations. 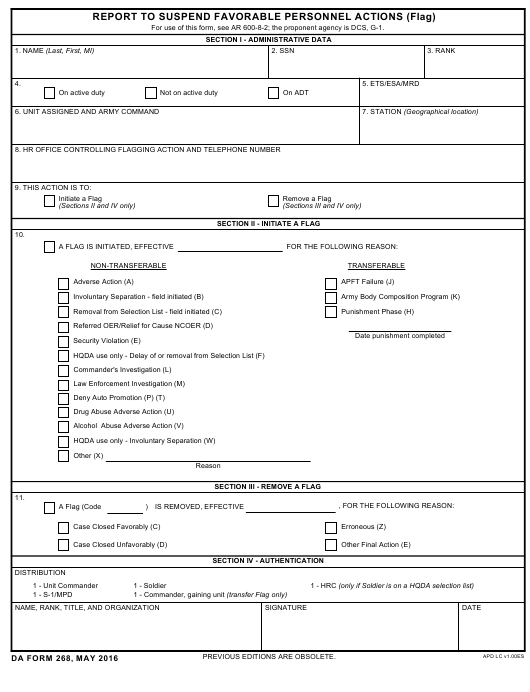 Section I contains Boxes 1 through 8 and is meant for providing the Soldier's personal information. The name must be entered in Box 1. Their SSN and Rank must be provided in Boxes 2 and 3 respectively. Box 4 is for specifying if a Soldier is on active duty, not on active duty or on ADT. Box 5 is for entering the ETS/ESA/MRD. The Unit assigned and Army Command must be specified in Box 6. The station must be specified in Box 7. The HR Office controlling the flagging action and its telephone number must be entered in Box 8. The type of action should be specified in Box 9. The two types of possible actions are flag removal and flag initiation. transferable, which means that it is possible to replace the flagged Soldier to another unit. Sections II and IV must be filled out if the form is used to initiate a flag. Sections III and IV are filled out if the form is filed for flag removal. Section II is for specifying a reason for initiating a Flag. The reason or reasons must be chosen from the list. If the reason is transferable, the date when the punishment is considered completed must be entered as well. Section III is for specifying a reason of removing a Flag. There is a list of reasons to choose from. Section IV is for the authentication of the document. The name, rank, title, and organization of those filing the Form must be specified in the corresponding boxes. The form must then be signed and dated. After the form is filled in, it is submitted with the supporting documentation to the General Officer Management Office, where the decision will be made. It is necessary to remember that the Flags are not used as a punishment or restriction but as an administrative tool. The Flag itself is not a final disposition. It is initiated during any kind of disciplinary or administrative action. DA Form 268 is completed in case it will be necessary to prove that favorable personnel actions are suspended with regard to the affected Soldier. No "need to know" people are informed about the Flag. Only those who need to know about the Flag in order to perform their duties should have any information about it. A separate DA Form 268 is prepared to remove a Flag when the Soldier's status changes from unfavorable to favorable. The Flag must be removed from the HR systems within 3 working days. There is basically nothing a soldier can do to request Flag removal. The Commander will identify a requirement for a flag, direct unit personnel or S1 to prepare a DA 268 and submit the form along with the Soldiers' APFT cards and counseling statement to the Office before they make the final decision.